Across continents, industries and opportunities, Intermarine is a leader in worldwide ocean transport that responds to the demands of a world-on-the-move by focusing on its customers and their cargo. As a forward-thinking marine logistics and ocean transport provider, Intermarine combines its vast global infrastructure and industry expertise to address the comprehensive needs of breakbulk, heavylift, dry bulk and project cargo customers. Whatever the challenge, Intermarine’s network of professionals is focused on increasing efficiency and offering unmatched flexibility to ensure clients benefit from customized solutions that meet their specific requirements. Intermarine leverages the collective knowledge and performance of each and every employee, whose dedicated efforts result in total customer satisfaction. Whatever you need to send, wherever you need to send it, Intermarine has the routes and schedules to meet your needs. Founded in 1990, Intermarine controls an international fleet of more than 50 vessels with a lifting capacity up to 800mt. Through its subsidiaries and worldwide network of 21 offices, Intermarine provides safe and highly reliable ocean liner transportation, chartering and marine logistics services with regular sailings in the Americas, West Africa, Europe, Asia and the Middle East, as well as inducement voyages to Australia and other international ports. In addition to operating the largest US flag heavylift fleet, Intermarine controls Industrial Terminals, the largest US project cargo and leading regional breakbulk terminal, strategically located on 95 acres adjacent to the Houston Ship Channel. Industrial Terminals provides maximum flexibility for handling project and breakbulk cargo to multiple trade lanes with its three deep-water berths, a 457m barge terminal with rail support, cargo marshaling capacity with covered warehousing, ITEX delivery service, IPACK export packing services, direct ship-to-rail access and Saturday receiving. Intermarine comprises five core business units, namely Americas Services, North Coast of South America and the Caribbean, East Coast of South America, West Coast of South America and US Flag Services. 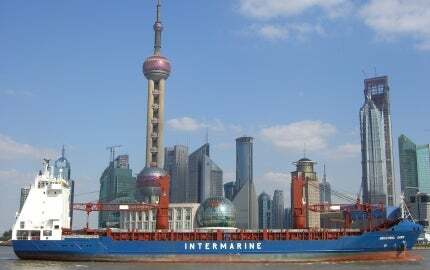 Intermarine’s worldwide chartering services deliver premier solutions in specialized worldwide project and heavylift cargo transportation outside the main liner service routes, for global reach with a local focus. As a result of customer demand, Intermarine initiated services to Africa in 2012, which are growing steadily as need increases. The worldwide wind division also addresses unique transportation challenges facing the wind energy industry and creates many components with extreme sizes and diverse weights. Intermarine’s Venezuelan regional offices have added full logistics support for barge services with Linea Naviera Paramaconi S.A., which enables water, heavy-haul inland transport and shallow draft transport. In addition, Intermarine offers the fastest and most direct container service to ports in South America, arranging container stuffing and trucking to and from the terminal on a weekly or per-project basis. In March 2014, Intermarine held the grand opening of its state-of-the-art operations center at Industrial Terminals. Unique to the region, this landmark building unites Intermarine’s technical, operations, traffic and terminal teams in one location, enhancing efficiency and helping the company grow. The five-story, 13,311ft² structure, just 200ft from the Houston Ship Channel, houses a fourth-floor customer center with floor-to-ceiling windows and audiovisual equipment that provides sightlines to all the main docks, so customers can monitor their cargo’s movement in comfort. In favorable weather, people can visit the fifth-floor observation deck, which has unobstructed, 360° views from the Beltway to Downtown Houston. The operations center is not only functional, it’s also open to Houston business and industry groups for special events. Intermarine and Angolan company Transtar Transitario have formed a joint-venture (JV), to be known as Transmarine, which will operate in the ocean carriage of oil and gas equipment to Angolan ports. The world's largest oilfield discovered since 2014, the SNE Deepwater Oil Field is located in the Rufisque, Sangomar and Sangomar Deep Blocks, which cover a combined area of 7,490km² within the Senegalese portion of the Mauritania-Senegal-Guinea Bissau Basin.